GCalToolkit is a very powerful tool capable of deleting or editing your ENTIRE GOOGLE CALENDAR. 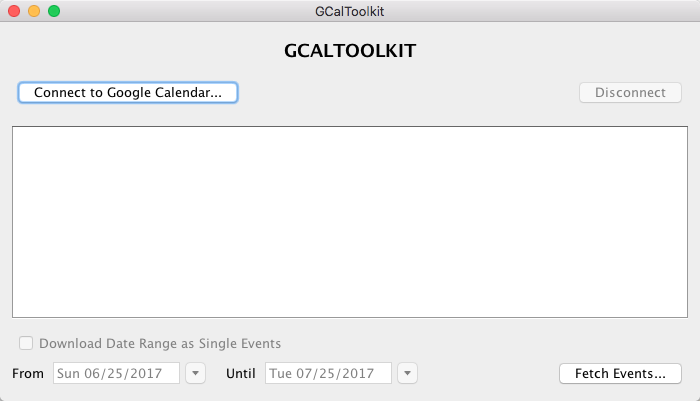 PLEASE back up your calendar as an iCal file (under Google Calendar Settings, Calendars, "Export") before using GCalToolkit. NO EVENTS ARE ACTUALLY DELETED OR EDITED UNTIL YOU CLICK "SYNC TO GOOGLE"
If you did not download GCalToolkit from this website, please install the latest version from the Download page. If GCalToolkit does not work as expected, please first read the "Google Quota" section at the bottom of this page. Please note that the Trial Version is limited to a maximum of 500 events. 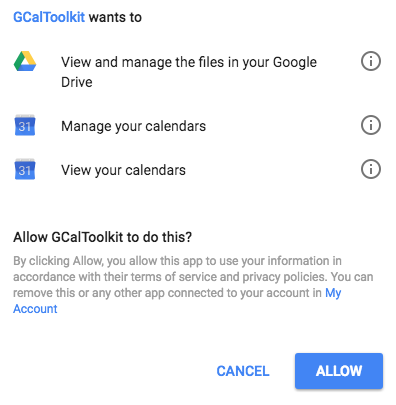 Before using GCalToolkit you need to connect to your Google Calendar and download a calendar. Once you have logged in you will see the list of your Google Calendars and you are ready to select one, or several, and click "Fetch Events". In the Full Version of GCalToolkit you can choose to download "Download Date Range as Single Events". This will expand all repeats to display as multiple single events, and will therefore also display events that are part of a repeat series starting before the selected date range. (Please see "Google Quota" below). Use this option if you want to export events to a spreadsheet with multiple entries for your repeat events, or delete singles that duplicate repeats. Fill in the email address with which you registered on www.gcaltoolkit.com, and your Invoice ID. The Invoice ID can be found in the confirmation email that was sent after payment, on your PayPal receipt, and on the "Membership" page when logged in to gcaltoolkit.com. Alternatively you can use your www.gcaltoolkit.com password, as in earlier versions of GCalToolkit. NO EVENTS ARE DELETED/EDITED UNTIL YOU CLICK "SYNC TO GOOGLE"
If your aim is simply to remove duplicates, you only have to click this button to remove all the duplicates detected by GCalToolkit. This button applies all the changes to your Google Calendar. You can interrupt this process if necessary by clicking the "Cancel" button. The totals top right keep you informed as to the changes that have been made, and those that will be made when you hit "Sync to Google" - use "Preview Changes" to check what will be changed before you do so. EVENTS WINDOW OVERVIEW: GCalToolkit displays a list of all the events downloaded, including the Title, Summary (Description/Note), Location, Start and End Times/Dates (All Day Events are GREY), whether the event is a repeat (unless you downloaded with the option "Display Repeats from Earlier Events" above). The events window displays all the downloaded events unless you have applied event, date or text filters, or if you have clicked "Preview Changes", in which case all the events that are to be changed in your Google Calendar will be displayed. You can click on column headers to sort alphabetically etc and resize the columns and rows, and right click on the column headers to choose which columns to display or hide. This also hides columns when exporting to a spreadsheet. "Detect Duplicates": When you download a calendar all the duplicates are automatically marked as "Duplicates" and "To Be Deleted" as soon as you click "Sync to Google". If you choose "Keep Visible Events", thereby unmarking all visible events (including duplicates) for deletion, you can reselect the Duplicates for deletion with this function. "VISIBLE" vs "SELECTED": Events that display in the main scrolling window are said to be "Visible" - you use filters etc to configure which events display in this window, with a view to deleting or editing them en masse. "Selected" means that the events have been highlighted and appear with a blue background. Select events by either by using the buttons, clicking on a row, ctrl-clicking or shift-clicking to select multiple rows, and click-dragging to select (or deselect) a range of events. "Preview Changes" / "Resume Editing": This displays all the events that will be changed (regardless of your filters) when you click "Sync to Google". Click again to "Resume Editing", with your filters applied as before. "Back to Calendars": Return to the Main Screen to log in to a different Google Account, or download other calendars. File Menu > "Save as Spreadsheet": This saves an Spreadsheet (.xls) or CSV (.csv) file containing only the visible events, subject to the Event types chosen, any filters that you have applied, and the columns you are viewing. To open in Excel you may need to choose "Import" and specify "Unicode UTF-8" and "Comma Separated". "Filter Events": Select This updates the events list according to the DATE and TEXT filter settings above the button. The dropdown lists below allow you to filter, in addition to DATE/TEXT,by the type of event (repeats, singles, all day/timed, and visibility). Select the Date / Text checkboxes first, then select dates or enter the text to filter, then click "Apply Filters" to display only the relevant events. Set a filter to "No Text Filter" or "No Date Filter" and click "FILTER EVENTS" to return to display all the downloaded events with no filters (apart from the event types chosen below). You should use filters in conjunction with "Delete Visible Events" and many other functions in the "Edit Selected Events" menu. You can also use Regular Expressions to both Filter and Search/Replace in Titles, Descriptions and Location fields. "Delete Visible Events": All the events that are visible in the entire main scrollable window will be marked for deletion. This only applies to visible events - subject to any date and text filters that you may have applied, and to the main "Display EVENT" types that have chosen to display. "Keep Visible Events": Any visible events, including duplicates, that are marked for deletion will be unmarked, and will not be deleted when you sync to Google. Again, this only applies to visible events - subject to any date and text filters that you may have applied, and to the main "EVENT" types that you have chosen to display. "Delete Selected Events":Any selected rows will be marked for deletion. To select multiple rows either hold down the "Control" key and click multiple events, or click the first event of a given range then hold down the "Shift" key and click the last event in the range. You can also click and drag with the mouse to select a range or events and then hold down the "Control" key to deselect events selected on subsequent clicks. This can be used in conjunction with ordering - simply click certain column headers to order events by that column, e.g "Created" date or "Start" date. "Keep Selected Events": Any selected rows will be unmarked for deletion. "Delete All Duplicates": When you download a calendar all the duplicates are automatically marked as "Duplicates" and "To Be Deleted" as soon as you click "Sync to Google". If you choose "Delete No Visible Events", thereby unmarking all events (including duplicates) for deletion, you can reselect the Duplicates for deletion here. "Search/Replace": Replace any text in the Title, Summary or Location of all the visible events. You can choose to apply this to selected events, visible events, or all events - subject to any event, date and text filters that you may have applied. Full Regular Expressions can be used, with groups '()' in search terms referred to as $1 etc in 'Replace'. Please refer to standard RegEx tutorials. This contains many useful functions to mass edit selected events. Change hidden events properties, attach Google Drive documents with just a filename in the description such as "<MyDocName>", revert changes to text fields, update/revert free/busy status, reminders, and more. To attach files you need to add a filename of at least 4 letters/numbers between the tags you define in the Options > Attachments; by default you can use <> so to attach a file called 'test' you would put <test> anywhere in the location or description. The first match in Google Drive whose title contains the text you tagged will be attached, and the tags replaced or not, according to your Options. You can also add multiple files,by using, for example, <invoices-2017-001-012> or any variation that has two hyphenated groups followed by two more to specify the range. The above example will attach all files matching the name "invoice-2017-001", "invoice-2017-002", "invoice-2017-003"... The tags that you added can be replaced with an indicator <+12 invoices-2017>, again configured in Options > Attachments. Once you have added the tags in the descriptions/locations for your events you need to select all the items in your calendar that you want to tag (or just select/highlight all events by selecting an event and clicking ctrl-a), select the autoattach option in the "Edit Selected Events" dropdown list as shown in the attached photo, and click "Apply". Your files should now be ready to link, which you do by clicking "Sync to Google". Toggle "Busy" setting: Once you have used the filters to display (or you have manually selected) a group of events you can select these to switch the Free/Busy status of all the events at once. Toggle "Guests Can Modify" option: When sharing events or entire calendars this enables you to make mass changes to the access accorded to guests, allowing them (or not) to make changes to events. Apply Default Reminder: Use this to set many events to the Google Default Reminder that you have configured in the Google Calendar Settings. Repeat events are displayed with a black border around the Start column. You can expand repeat events to multiple singles: first select a repeat, then right-click and choose "Download Repeat Series". To do this for multiple events first select all the events you wish to download, then click the Edit menu, and select "Download Repeat Series". The original repeats will be replaced by single instances of every occurence, which can be deleted, edited etc. Right-click any event and click "Open in Google Calendar" to view the event in your default browser - you must be logged in to the correct Google account in the browser for this to work. 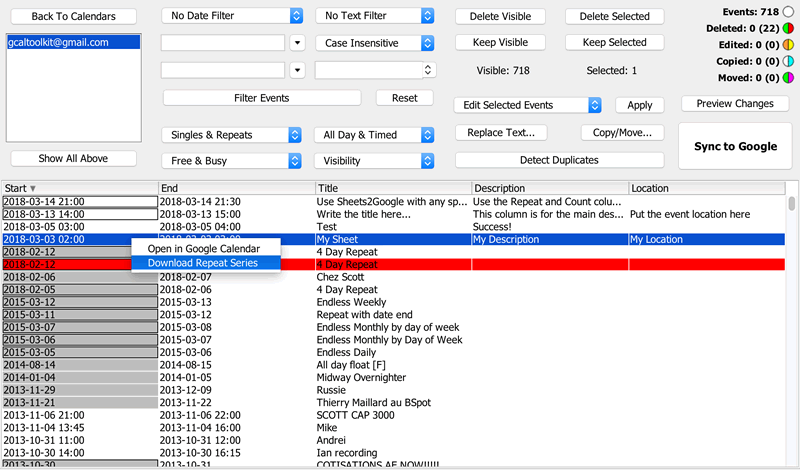 Once you have used the filters to display (or you have manually selected) a group of events you can use this to copy all the displayed or highlighted events into a different calendar (which you must create first in Google Calendar "Settings"). If you "Move" events the original will be cloned, and then deleted once successfully copied; Copy and Move keep all information intact except Guests, which are removed by default for Copy unless you check the option "Add Guests On Copy", and preserved by default when Moved unless you uncheck the option "Add Guests On Move". You also have an option to shift the chosen events forwards or backwards in time during the copy/move, and a "Multiple Shift" option for Copy; this feature can be used, for example, to duplicate an entire work shift one or many times. The latest version of GCalToolkit can shift any type of event accurately, including updating exceptions to the repeat series, UNTIL dates when specified instead of the number of repeats, and BYDAY days for weekly events. "Duplicate Detection": The rules for duplicate detection can be relaxed to include any events with exactly the same title & start time, or any other criteria - select "Duplicates Tab" in the Options menu in the Events Window. 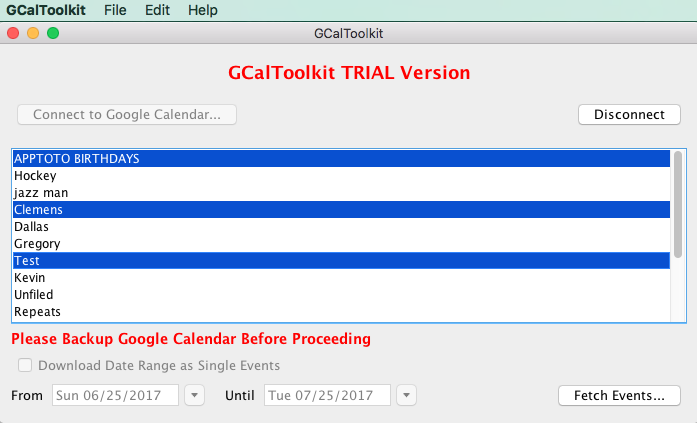 "Set Preferred Calendar": If you have downloaded multiple calendars and there are duplicates across several of them then GCalToolkit needs to know in which calendar you would like to keep the original event. By default this is your main calendar - in this window you can choose a different calendar as your "preferred calendar". Other settings here include whether to keep Guest information intact when performing COPY and MOVE, visual themes, and your LICENCE registration details for the full version. GCalToolkit lists events in rows and columns - you can change the order of the events by clicking at the top of a column. This allows you to click the "Created" column header to order your events by the date that they were created/imported/synced to Google Calendars, and then use multiple selection (ctrl/shift click + "Delete Highlighted Events" from the Edit menu) to delete a single Import/Sync session. Introduction to the "Google Quota"
Google Calendars has a quota system that limits accounts to approximately 18,000 - 20,000 events edited/deleted within a 24 hour period. GCalToolkit allows you to save your session if you reach this limit so that you can continue working on a session as soon your Quota has been reset (usually 24 hours). If you experience problems when using GCalToolkit on large calendars then please bear this in mind - if the problem persists please contact me on the contact page. Please note that if you have recently had a problem involving the creation of large numbers of duplicates then you may already be at, or near, your daily quota; if this is the case, be sure to first remove the source of the duplicates (usually Blackberry or Outlook syncing) and wait 24 hours for your quota to be reset before using GCalToolkit.